Muskoka is reknown for being cottage country, but what draws cottager's to this region? Perhaps its the beautiful natural surroundings? Or, perhaps the freedom and quietness of the setting? For us, it was the combination of the two. Bracebridge is situated on the Muskoka River waterfall and is surrounded by other streams and rivers. These marshlands, rivers, and wetlands bring anglers and hunters to Bracebridge and the surrounding Muskoka region, but it also attracted us to take advantage of these natural settings. What we noticed about this particular shoot was that these natural wonders give a beautiful serene setting to our wedding photographs, which gave us a lot to work with. In this photo, there was a wooden dock that we used as a platform to place the bride and groom in the middle of the photo. The overwhelming foliage of this setting draws the attention of the view on the important subject matter that is the bride and groom. The bride and groom were also placed on the opposite side of the river which gave this breathtaking image of the wedding gown reflecting in the calm, still water. 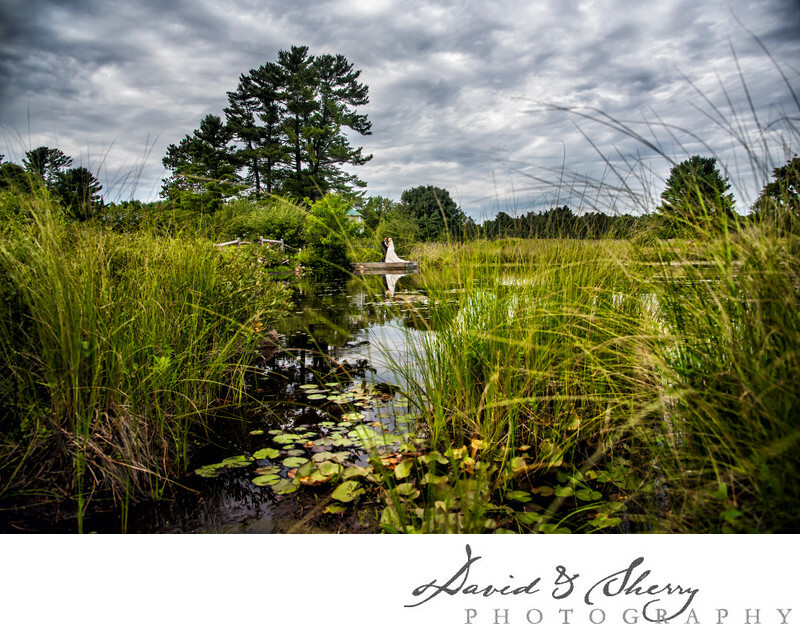 The overall wedding shoot was Even overcast days do nothing to tarnish the beauty of the landscape and, if anything, give an enchanting atmosphere to the photo.